On the 27th of June 2018, thirty of our students set out on a trip to Europe for the Career Exploratory Programme. 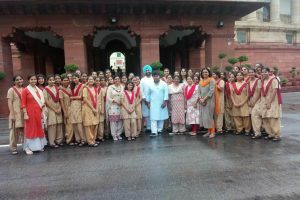 They were escorted by Dr. Sultana Khan, Mrs Rakhee Mishra and Mrs Juhi Misra. The first stopover was at Paris. We visited the famous Musee Du Louvre which is house to master pieces and paintings by the best artists in the world. The Mona Lisa, The Wedding at Cana, The Winged Victory of Samothrace, The Venus De Milo, The Coronation of Napoleon to name just a few of the masterpieces we saw, each of aesthetic and historical importance. We explored more of Paris as we cruised along River Seine in the evening. Students enjoyed the rides at the most beautiful theme park, Disneyland and then we climbed the much awaited Eiffel Tower. At 324 m tall, this architectural marvel offers an amazing 360ᵒ view of Paris. The next day we took a bus ride to the United Nations Office at Geneva, one of the most active centers for multilateral diplomacy in the world. We walked in the chambers of its emblematic building where many important negotiations took place, discovered the incredible gifts presented by various countries to the UN and the UN’s current activities. 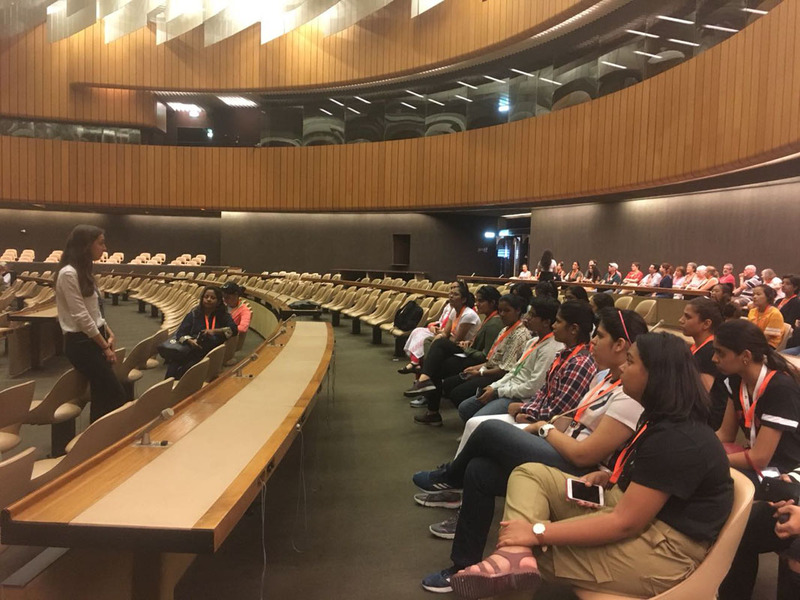 In the information session and the guided tour we learnt about the international relations and the impact of the work carried out in Geneva and around the world. We also found out what exactly one needs to do to make a career in international relations. On the 30th of June we went to the much awaited CERN, The European organization for Nuclear Research, which is the world’s largest particle physics laboratory. The information session on particle physics, multimedia presentation on Synchrocyclotron and the Atlas detector helped us to unravel the mysterious world of subatomic particles, and how the universe came into being. 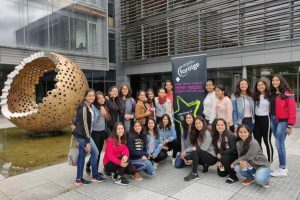 The tour gave us a better understanding of the wide spectrum of career opportunities in a big scientific laboratory such as CERN and allowed students to gain practical experience in science, technology and innovation. Later in the day we took a guided sightseeing tour of Geneva old town and saw top attractions such as the fountain of Jet d’ Eau in Lake Geneva, the Flower Clock and more. It was interesting to know about the history of Swiss Federation. And then came true our dream of visiting a real chocolate factory! Nestled between Fribourg and Montreux is Maison Cailler, a chocolate factory and museum like out of a picture book. As we explored the chocolate world which started with a multimedia presentation, we learnt about the history of chocolates and its manufacturing with all our senses. A fully automated production line was in action. The best part was that they allowed all visitors to sample all varieties of chocolates. The factory store has an endless selection of chocolates on sale and we all bought chocolates to our hearts’ content. On the 1st of July we took the revolving Rotair cable car to the top of Mount Titlis. The way to the top is a spectacular sight of the glacier’s deep crevasses and gigantic ice boulders. We walked over Europe’s highest suspension bridge, the Cliff Walk, rode the Ice Flyer, did sledging and even snow fights! On our way back, we visited the Lion Monument and learnt about its history. The next day we were at Milan, the fashion capital of the world. We took a guided tour to the IED campus and saw their hi tech labs, in the information session we gained insight into the variety of courses offered in the disciplines of design, fashion, visual communication and management and also the admission process. We then attended a hand on workshop on Fashion design at Fiorella Ciaboca Sartoria by an Italian fashion designer. 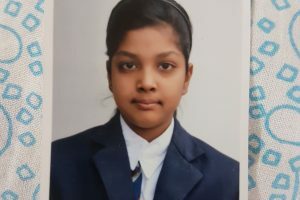 The designer gave us firsthand experience of different aspects of working as a fashion designer as we did some cutting, embroidering and designing of garments under her guidance. On the 3rd of July we went to the Ferrari Museum in Marnello which focuses on the auto manufacturer’s history and production. We attended the Red Campus workshop on technology, science, marketing and team building. After a sumptuous lunch at an Italian restaurant we headed for Pisa our next stop. Next morning as we entered the Square of Miracles (Piazza de Miracolli) we were captivated by the sight of the Leaning Tower of Pisa. We saw it from all angles and even clicked classic pictures pretending to support the leaning tower of Pisa. The Cathedral and Baptistery, also in the same Piazza are also marvelous artistic attractions. We then visited the Scuola Politecnica di Design . It is a postgraduate training institution that focuses on project disciplines in the areas of design and visual communication. In the information session we discovered that the postgrad offering of SPD includes masters in industrial design, interior design, transportation and car design, visual design, ‘Web design and multimedia’. We also learnt about their admission process. We then headed towards the historic city of Rome, a city steeped in rich history, boasting beautiful buildings and awe-inspiring ruins. We made it just in time to visit St. Peter’s Square and St Peter’s Basilica in Vatican City. It was truly a fascinating experience. Our knowledgeable guide then walked us to the Colosseum, the largest structure left to us by Roman antiquity, beside the Colosseum stood the Arch of Constantine. We also saw the Roman Forum, Vittorio Emmanuele II monument, Testoccio on our guided city tour, which concluded at the incredibly ornate Trevi Fountain. The next day, our last day in Europe we attended a Pizza making workshop. We discovered the authentic recipe to an Italian Pizza. Each of us rolled out a pizza for ourselves with toppings to our liking, got it baked and ate them. The most delightful part of the workshop was the Italian dessert Panna Cotta served to us. Our sojourn in Europe was full of exploring new career options, having loads of fun, new learning, delectable local cuisines, and interesting sights abound! We thank our Principal, Ma’am Kanchan Khandke for giving us this opportunity.